It's so cold! So very cold -28C/-35C with the winchill. I thought I left this behind when we moved from Manitoba, temperatures hitting -50 with the windchill were not uncommon there. The winter before we moved here we had a month of -50 straight. Ugh. Am I thankful that there is no school for the next 2 weeks? Heck ya! We can "hibernate". I feel sorry for my heating bill, it's won't be pretty. I will likely need CPR after I open it up. The bright side? Only 5 more sleeps til Santa comes. Yay! It's miserable. And it's not all that cold. 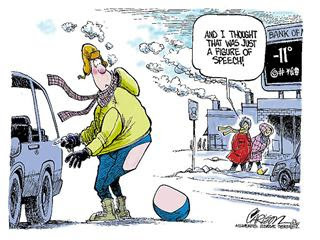 We usually get a couple of 2-3 week spells of -40, plus windchill. I'm not sure why it seems so cold right now - maybe because it's so early in the season? yips! It is -7 here and I am moaning and complaining! LOLOL! Funny comic. Holy stinkin cow!!!!! It GETS that cold?!??! WHOA!!!!! OK. That's just unreasonable. I thought we were cold when it hit 39 the last few weeks in the morning. You guys would be out in your t shirts at that temp!!! Glad you have a toasty heater!